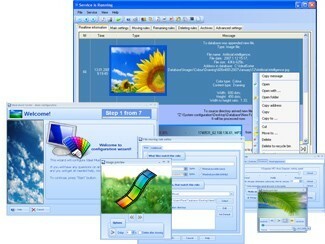 For example, Digital photo organizer can Organize digital photos by XMP photo tags. XMP stands for "Extensible Metadata Platform", an XML/RDF-based metadata format which is being pushed by Adobe. Information in this format can be embedded in many different image file types including JPG, JP2, TIFF, GIF, EPS, PDF, PSD, IND, INX, PNG, DJVU, SVG, PGF, MIFF, XCF, CRW, DNG and a variety of proprietary TIFF-based RAW images, as well as MOV, AVI, ASF, WMV, FLV, SWF and MP4 videos and audio formats supporting ID3v2 information. The Adobe Extensible Metadata Platform (XMP) is a standard, created by Adobe Systems Inc., for processing and storing standardized and proprietary information relating to the contents of a file. XMP standardizes the definition, creation, and processing of extensible metadata. Serialized XMP can be embedded into a significant number of popular file formats, without breaking their readability by non-XMP-aware applications. Embedding metadata avoids many problems that occur when metadata is stored separately. XMP is used in PDF, photography and photo editing applications.